That’s the name of my cooking game friend! This salmon is both of those things…super simple to prepare and oh, so tasty too! Salmon recipes are not ones I share around here often, but I think it’s important to serve fish and seafood as part of a balanced diet. When I do serve salmon or other more expensive meats, I try to pair them with other inexpensive ingredients like rice or homemade bread. Keep the meal simple, yet scrumptious. This is a freezer marinade…and one that I use often for salmon (and chicken too!). I find that I often have my meals planned out for the week when I spot a great sale or deal on salmon. So I’ll scoop up the salmon and then add some marinade to it and freeze it until it’s time to enjoy it. I could rearrange the meal plan…but I can freeze it too! This marinade is super basic and easy to prepare for smaller or larger amounts. It’s 1 Tbsp maple + 1 Tbsp Dijon mustard for every 1/4 lb. of salmon (or chicken!). Hope you enjoy it! 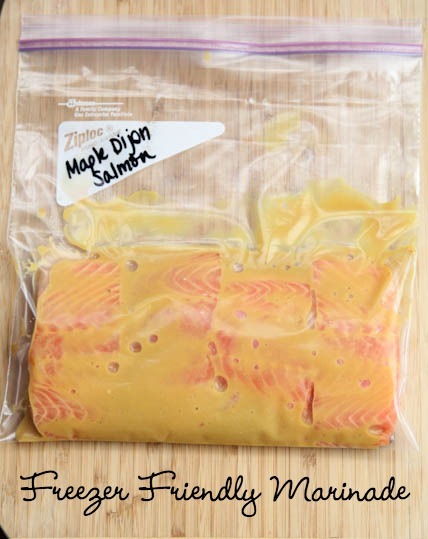 Add the salmon to a plastic freezer baggie or container. Sprinkle a little salt and pepper over the top of the steaks. In a small mixing bowl, whisk together the maple syrup and the Dijon mustard. Pour over the salmon in the baggie or container. Seal and freeze. 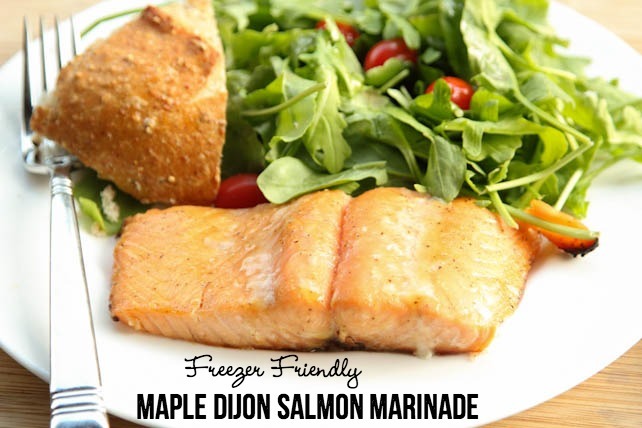 Thaw in the refrigerator overnight and then grill or bake until salmon is cooked through. Serve with side of rice or bread and salad or veggies. This post is featured in Meal Plan Monday #5.